The foil is a 35” lightweight, rectangular blade that weighs less than one pound. Each foil has a blunt, spring-loaded button at the point of the blade that must be depressed with a pressure of 500 grams or more in order to register a hit. Foil actions often occur at blinding speed, which necessitated the creation of an electrical scoring system to accurately detect hits on valid targets. The foil fencer’s uniform features an electrically wired metallic vest called a lamé. A hit to the lamé causes the scoring machine to display a colored light on the side of the fencer that scored the touch. An off-target hit on the arms, legs, or head (basically any area not covered by the lamés), causes the machine to display a white light. Hits that are off-target stop the action of the match, but no touches are awarded. If the scoring machine displays both a colored light and a white light, it means the fencer quickly hit off-target and then hit on target before the machine could lock out. In situations like that, the fencer’s hit is ruled off target and no touch is awarded. Another part of the foil fencer’s equipment is a special cable called a body cord. This plugs into the foil and runs through the sleeve of the jacket and out the back of the uniform, connecting to a retractable reel which is connected to the scoring machine. Of course, with all this equipment a lot can go wrong, so before each foil bout commences, both fencers ceremoniously test each other’s lamés to ensure they are working properly. If your child is ready to learn the art and discipline of foil fencing, get in touch with us at Cedar Grove’s Lilov Fencing Academy. 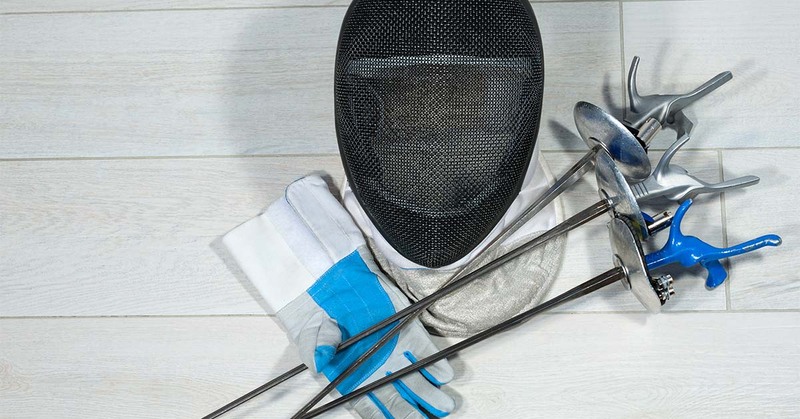 We offer fencing lessons, fencing classes, and fencing camps for kids of any age.